This is so well made and gorgeous. I am using it for my holiday tabel over a white dotted tablecloth. I am putting it at an angle as the accent over the main tablecloth. Wonderful! 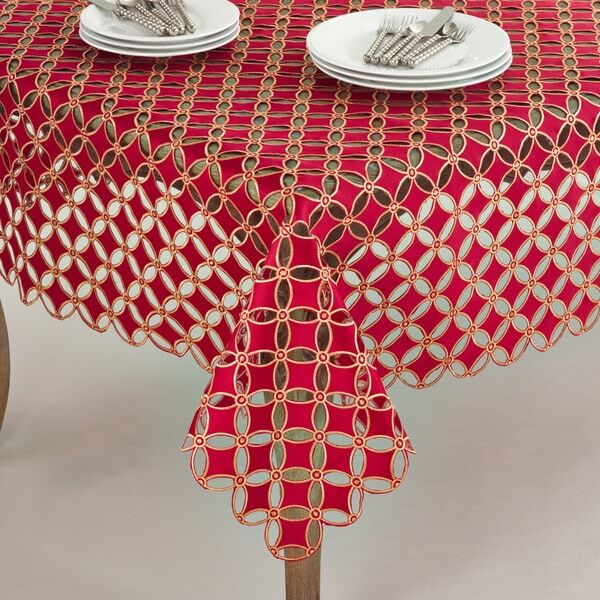 Dress your table in holiday style with Saro Lifestyle's Buche de Noel Collection cutwork design tablecloth. These Tablecloths are perfect for holiday dining. Dimensions 67.0 In. X 67.0 In. X 0.25 In. Option: Geometric/Design - Christmas - Red - 67" x 67"
Option: Geometric/Design - Christmas - Red - 84" x 84"
Option: Design - Christmas/Winter - Silver - 67" x 67"